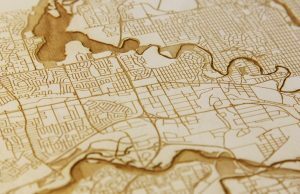 Engraving, or carving a shallow relief, in a sheet of plywood is usually achieved with a router. Note: It is very hard to carve plywood with traditional wood carving tools such as a hammer and chisel. This router could either be hand controlled or machine controlled. In either case, the router will be fitted with a bullnose bit and set to a shallow enough depth to remove only enough of the surface to show a design or perhaps lettering. Machine controlled routers will allow for variation in the depth of the cut and allow for more complex surface textures and reliefs. Best results are obtained with multiple passes of the cutting tip, each being slightly deeper than the last. Sharp edges and corners can be finished by using traditional hand tools, such as chisels and files. Another very different approach is to use masks and a sand blaster, which gives a more organic and natural finish. Masks are usually made from some type of sheet metal material, which is cut out to reveal the design that will be engraved into the plywood surface. This sheet or mask is laid on top of the plywood and fastened in place securely. Then with a sand blaster, the exposed wood surface is blown away by the stream of sand particles suspended in the flow of air from the nozzle of the sand blaster. Designs that include “islands” or areas not connected to the rest of the mask should be avoided if possible, as it is hard to hold the disconnected areas in place exactly as they should be, especially if they are not very large. Note: DIY or prosumer type sandblasters are not usually able to deliver enough volume of material to be very effective in anything but the smallest projects. Professional sandblasting rigs deliver a huge amount of air. In this case, it is the volume of air, not pressure, that makes the difference. Home-shop style compressors are not usually capable of delivering sufficient volumes of air to be of any real use for a sandblasting setup. A work-around solution can be achieved by setting up several portable compressors in parallel to increase the volume of air available but not the pressure. There are small scale, DIY style, machine operated router rigs that work on a similar system to a CNC cutting table. These home operated rigs, in most cases can only work on small pieces one or two feet square. To use these types of machines, you will usually need to be able to convert digital files representing the shape you wish to carve or reveal in the plywood surface into a series of commands which will move the router across the surface to be routed. These movements are defined as values in an x – y plane with z being the depth of the cut at any particular location. You will need software to create your shapes or designs either in 2D or 3D and another software package is needed to convert these shapes into a series of commands and movements for the router bit tip to follow. Because of this, various compatibility issues can arise and it may not be a simple process; as the movements and height of the router need to be compatible with the shape of the router bit and the router’s general settings (speed of rotation, etc.). If the router moves too fast or too deep, it might create too much heat, leave burn marks and start ripping the fibers of the wood. If it moves too slowly, ironically, the same may result, due to the router bit resting too long in the same location and creating friction burns. It will often take a little experimentation, adjusting the various settings, to achieve perfect results. It is not always understood that one of the ways saws and routers dissipate heat from the cutting point of contact is by the flow of the hot material that is sawn or milled away. If there is less material being released from the router bit and the setting edge, it will have a lower heat dissipation as a result.